Our middle school program embraces the passionate spirits, desire for independence, and keen sense of justice often alive in young people in these years. Our middle school students are challenged and guided academically, supported in their emotional and social growth, and given the opportunity to engage meaningfully with social justice inquiry. In this truly mixed-age environment, they are offered real ways to emerge as school-wide leaders. Middle school students are also welcome to participate in high school classes and to join the lower school in projects, like sewing or painting, that span all ages. In self-directing their own education, these young people know what it is to be both trusted and accountable; to have the space to make their own mistakes and learn from them; to be encouraged as they experience tremendous individual and collective growth. Mixed-age advisories and all-school activities. We honor the invaluable lessons young people teach each other. Every day includes time for students of all ages (from four to 18) to spend time together. Our advisory spans a two- to three-year age range. Students partner with teachers to choose classes. Teachers help students identify skills to improve on, while also teaching to students' strengths and interests. Students set academic and personal goals that guide their curriculum choices. Hands-on and real life learning. Students are supported in their pursuit of independent studies, internships, and trips, and are encouraged to share their own areas of expertise in student-led workshops, presentations, and classes. All studies are connected to wider world issues, and many are multidisciplinary. Trips and current events are a regular part of our curriculum. Students participate in their assessment with written self-evaluations and through maintaining a narrative transcript. Students also track their own studies with individual work folders, and build toward a portfolio of polished work in all disciplines. In addition to classes, foundational academic skills are expanded through independent reading in the school library, Math Lab, Writing Lab, and Book Club. The art room and music room are always open for student use. We celebrate that some of the longest lasting learning doesn’t happen in a book, or within the confines of traditional academics. We are learning to be big thinkers, and responsible, knowledgeable members of our larger communities. Staff and students use mediation, meetings, and conversation to solve problems and hold each other accountable. We provide space for every student’s needs, and make sure that every voice is heard. An issue that’s important to one student is and issue that’s important to the group. Our studies include a diverse and relevant array of topics and voices. We support the varied ways in which we all learn, and provide multiple access points to every lesson. We partner with the NYC DOE to provide IEP mandated services, including a SETSS (Special Education Teacher Support Service) provider who works in classes and in separate sessions to support students with learning disabilities. Trips are paid for from a shared fund, which is replenished by school-wide fundraising. Trips are only an option if the cost can be covered for every student. 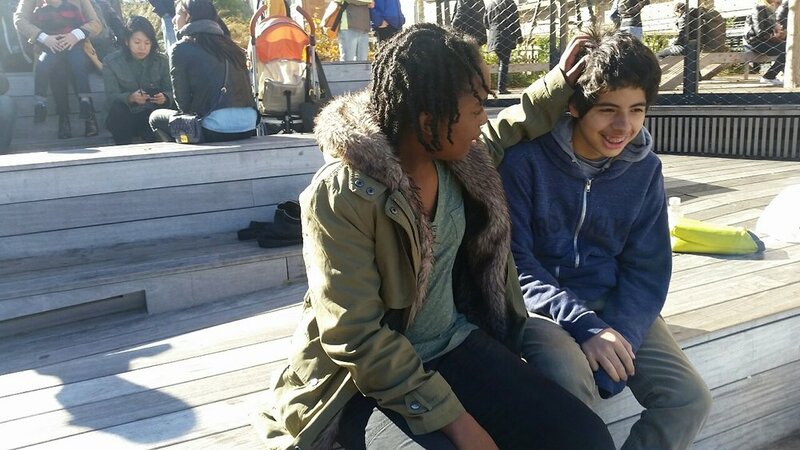 We prioritize daily time in our neighborhood outdoor spaces, as well as weekly student- and teacher-led trips. And we are flexible! Sometimes it’s important to just stay in the park a little bit longer than planned. Sometimes it’s the right day to take a walk. Our space is stocked with board games, cards, puzzles, DIY science experiments, building materials, as well as art and sewing supplies. We also reserve time in every week for group games and activities. The animation club is student run and meets regularly. We honor that all of us need time and space to grab a book in the library, play a card game with a friend, or simply have an unplanned conversation. Our students have the opportunity to design a school day that includes essential, unstructured time. A long-running BFS tradition, we join in multiage games of Capture the Flag in the park. Care for our building and shared spaces. Every day, middle school students are responsible for cleaning their floor, and every week they meet in mixed-age “pods” to care for shared spaces like our music room, art room, and library. Our families are an essential part of our school, and are invited to participate in the middle school as visiting teachers, chaperones, and guests for celebrations such as our advisory potlucks and spring barbecue. We also support the work of family through parenting workshops and affinity groups. We collectively choose an advisory name. We go to the park together, and take on group projects to which we all contribute. We hold each other accountable to our classroom agreements. We vote to make advisory decisions, while also making sure that the minority opinion is heard and respected. We support each other’s successes and challenges. We make time and space in our school day for connections to form and blossom.